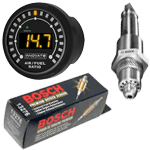 In this section you can find our range of automotive oxygen sensor products, we stock complete wideband kits and also some accessories such as replacement Bosch 4.9 oxygen sensors. 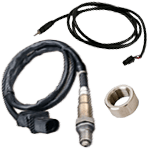 The oxygen sensor setup in performance vehicles is really an essential part of making sure the car is running right. 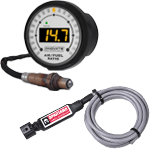 If you have a performance vehicle with an aftermarket ecu installed, using the factory narrowband sensor with your aftermarket ECU is less than ideal, this is because the narrowband types of oxygen sensors have a much more limited range compared to a wideband oxygen sensor. To properly monitor your air fuel ratios and for your ECU to do the same, a full wideband kit is really essential. Even if your car is not running an aftermarket ECU and you have made lots of modifications to your engine such as a bigger turbo etc, having a wideband setup is a great insurance policy to make sure what changes you have made aren’t to much for the ECU to handle.